Facebook Says It Has Figured Out Mobile. Wall Street Says It Believes Facebook. You can’t say Wall Street has agreed to forgive and forget its past issues with Facebook. But it’s getting closer: After a very strong Q2 earnings report, investors pushed shares up 17 percent in aftermarket trading. Facebook is now trading at about $31 a share, nearly as high as it has been all year. That still doesn’t bring it back to the $38 price from its 2012 IPO, but it’s definitely progress. Big picture: Facebook seems to have answered, at least for now, questions about its ability to handle the shift to mobile: Its users are headed there, and it is showing them ads there, and both usage and ad dollars are up. Facebook also took pains to explain that it is still totally cool with the kids. Which sounds a bit strained when they say it, but until people can show statistics proving otherwise, investors may cut them some slack. And Facebook COO Sheryl Sandberg also made a point of mentioning all the usage Facebook sees during prime time TV viewing hours. Translation: Hey Twitter — we can pitch social TV to advertisers, too. It’s more fun to come on an earnings call when Wall Street is psyched about your numbers, right? At least that’s the theory. Let’s see how Mark Zuckerberg and Sheryl Sandberg do following a strong quarter, which has investors bidding up their stock more than 14 percent in after-hours trading. Let’s listen in. Actually, I’ll listen: You guys watch me type a liveblog. 5:04 pm: Greetings. Listening to Mark Zuckerberg, reading with enthusiasm. Points out that results today come from big investments a few years ago. Promises patience for more long-term payouts. Did you know there are 5 billion people who aren’t on Facebook? Facebook is coming for you, people who are very likely not reading this liveblog! Facebook advertising isn’t just making money for Facebook, it is somehow improving the world’s overall economy. Ratio of daily active users to monthly active users is increasing — that is, as more people come on to Facebook, more people spend more time on Facebook. By the way, don’t believe those “Facebook engagement decreasing” reports: Market share steady or increasing. Now, about those teenagers you keep hearing about: They’re still totally using Facebook! Here Zuck uses a phrase that I don’t feel totally comfortable retyping. So. Instagram video growing fast. Facebook Graph Search and Facebook Home, not so much, but that’s totally cool, says Zuck. Think long-term! 5:10 pm: Zuck still pumped, and now he’s talking about ads, which is not a thing he would have been pumped to talk about a few years ago. Maybe even one year ago. 5:11 pm: Now, Sheryl Sandberg, who is less forcefully excited. But reciting impressive numbers regardless. Also talking up app ads, local ads. And hey, don’t look now but FB is up 20 percent since this afternoon’s numbers. Now taking time to talk up all the TV-watching, and TV-talking, that happens on Facebook. In other words: In case you didn’t catch this earlier, Twitter, we are totally coming after the social TV business you’ve been building. Heads up! 5:17 pm: And now CFO David Ebersman. Usage numbers are great. 699 million average daily users in June. Total time spent: 20 billion minutes each day. 5:25 pm: And now, ladies and gents, here’s Q&A, with Mike Isaac! 3:25 pm: Mike Isaac here, taking over for Peter on the questions from analysts. 3:26 pm: A question from Doug Anmuth on ads. Basically, is your big ad growth a lot more ads in the feed, or better ad products? 3:26 pm: Sandberg: Both! All! Also, we’ve got a big increase in demand from marketers. 3:27 pm: Mobile app install ads question — Sandberg says they’re small but growing. I asked about mobile app install ads, too, in a chat with Ebersman earlier. They’re sorta mum on its success specifically, but I hear that developers like them. 3:28 pm: Oh, if you’ve noticed, my time stamp is wonky. That’s because I’m sitting in an airport in Aspen, Colorado, liveblogging from the terminal as my flight has been delayed. Ho hum. 3:29 pm: A question on monetizing Instagram! Please tell us you have something in mind for that pretty photo-sharing app. 3:29 pm: Zuckerberg on Instagram: Non-answer. Yes, we want to build a business. “Probably through advertising.” But right now they’re focused on just letting the thing grow like crazy. True. It’s up above 130 MAUs. Pretty crazy. 3:30 pm: Sandberg on growth in ad spend: Yes! Soon! 3:31 pm: Growth is still strong across regions outside of the U.S., Sandberg said. Particular focus on Asia, seeing increasing adoption in APAC and the rest of the world. 3:33 pm: Sandberg says Facebook exchange is actually a small part of the company’s business. They’re expanding their on-the-ground sales force, too. 3:34 pm: Ebersman chimes in on how much the company is spending. No end in sight to the amount Facebook is spending to invest in the business. But he cites being “disciplined” and “focused” in their spending. In other words, it’s not all kegs and sushi bars for the campus. Lots of smart spending, he says. 3:36 pm: Sandberg: Facebook loves brands. Brands love Facebook. 3:37 pm: More TV talk in this call. Quite a direct shot over the bow at Twitter, the social company that has long promoted its “second-screen-ness” and complementary nature to television. 3:38 pm: Ebersman again on spending: Hardware costs probably going to go down, but product development is a variable. 5:39 pm: Hello again! It’s Peter Kafka! I’m very excited! Some talk about lumps and inflections re: mobile. There was “more feed eligible demand” this quarter, says Ebersman. Yet, price didn’t drop as they sold more ads. 5:43 pm: New question: Five percent of News Feed is now ads. Is that the “right” number and how does that vary across geography? Also a multipart question I didn’t get. Ebersman: Re: Five percent, it was 0 percent a year ago. We’re happy with it. Varies by geography, and also by person (which maybe explains why I don’t see that many ads in my feed compared to some complainers). 5:45 pm: Q: When are you going to get around to rolling out video ads? Also, what’s going on in Europe? Sandberg: We totally have video ads — you can embed a video in your post. “We’re exploring how we can expand that” but if you think I’m going to talk about a product we haven’t announced, then I would like to sell you a premium Bebo membership. 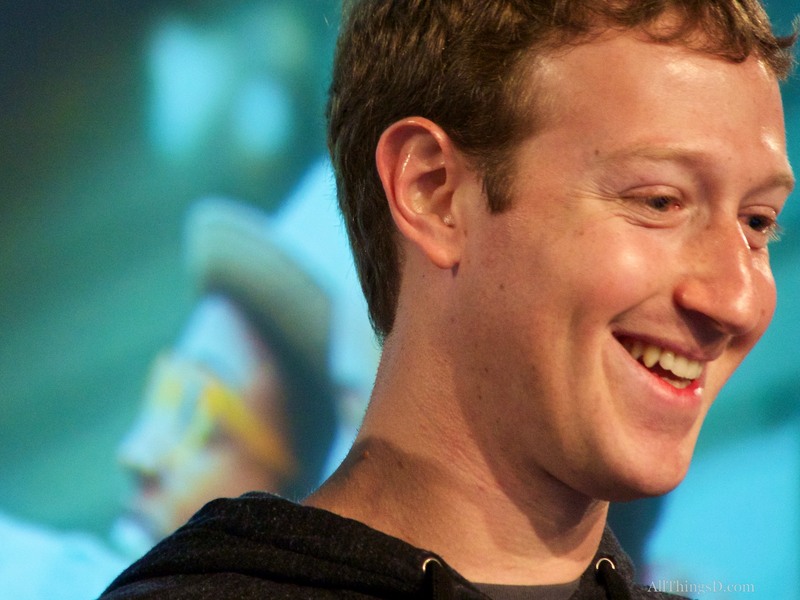 Zuckerberg: We’ve been charging developers for distribution, and they like it. That’s a shift. Zuck: We hit the 1 billion people mark, which used to be a rallying cry. Now we have bigger ambitions. But now, meh. “The real goal is to connect everyone in the world, and map out everything there is.” But! We weren’t happy with mobile 18 months ago, so we had to do a lot of work on it. Coming into 2013, we started to see that we were in better shape. So: Sort of a big picture answer. But maybe not really? 3:50 pm: Isaac here again! 3:50 pm: I swear we aren’t time traveling. 3:50 pm: Question: Really guys, what ad units made you guys kill this quarter so hard? 3:51 pm: Sandberg: Direct response marketers are big contributors to growth. E-commerce doubled! They use all sorts of our ad products. Lots of growth in mobile app install ads. Small market, but we offer a product that no one else has. Yep, that ad unit is shining. 3:53 pm: Again, a question on growth. 3:54 pm: Direct response marketers are bumping up their ad budgets because they’re getting good returns, Sandberg says. 3:55 pm: Ooh! A sort of sideways question on hiring and perhaps a way to talk about the ZuckerPAC, Fwd.us. 3:55 pm: Mark takes the hiring question. Hiring great people is hard. But “our country doesn’t produce the volume of engineeers that our companies want to hire.” So basically that’s why he’s doing this Fwd thing. 3:56 pm: Sandberg highlights General Electric’s Instagram campaigns. They aren’t paid ads, but rather fancy photos of GE-related products and such. In other words, brands are willing to experiment. 3:57 pm: A custom audiences question — Sandberg said they’ve doubled the number of marketers using that particular product over the period of two quarters. Lots of big brands doing it. 3:58 pm: Sandberg plays up “PMDs” — or third-party ad sellers — and wants brands to buy through multiple sales channels. 3:59 pm: Last question is a softball. Why do consumers like your stuff? 3:59 pm: Zuckerberg says Instagram is easy, everyone loves photos and capturing moments. 4:00 pm: His comments on Facebook “Home” are interesting. Look at it over the long term. Sort of like a seed that Facebook is planting. 4:00 pm: Just look at how naturally they fit into the flow of peoples’ daily lives to get an idea of how long it will take to get popular, Zuckerberg says. 4:01 pm: And we’re done! Kafka and Isaac — out.